Next year is definitely an amazing year for book-to-movie adaptations, with the recent success of 'Catching Fire' fueling the fire to make more of our favourite fictional worlds come alive. I'm excited for so many of these movies, and despite being hesitant of them missing important parts out or making the wrong casting-choices, I hope it gets people reading the books that readers fell in love with in the first place. Anyway, cue months of waiting, jumping-up-and-down over the latest trailers and tissues, lot's of tissues! Of course, I haven't read every book that is making it's way onto the big-screen, but my plan is to do so nearer to the film's release! From the novel by Marcus Zusak, 'The Book Thief' is out in February 2014 in cinemas! Just from the trailer, you can see this film is going to be breath-taking. I did start reading 'The Book Thief' a few months ago, but somehow, I stopped and never got back to it. Despite Death not making an appearance in the trailer, it has been confirmed that it will still narrate the movie - which is something I am really happy about, because I thought it was such a unique way to tell a story. When I first watched the trailer, I had tears in my eyes, and I've got a feeling this is going to be heart-breaking when I finally see it! The music is also gorgeous throughout the trailer! The portrayal of life in Nazi Germany you can see is so strong, as well as Sophie Nelisse's Liesel. I've decided to use the first released clip from the film, which debuted earlier this week, because I didn't really like the trailer. Compared to the trailer, the first clip really introduces Tris and Four, and portrays a huge amount of emotion. After reading 'Allegiant', and knowing how the whole franchise will end, I'm not quite sure how it's going to feel watching the characters I love come-alive but, I hope it is as good as the book - which is a challenge, I'll admit. Even so, I have a lot more faith in Theo James' portrayal as Four after watching! 'Divergent' is the adaptation of the first-book in the best-selling series by Veronica Roth and will hit cinemas on 21st March 2014! 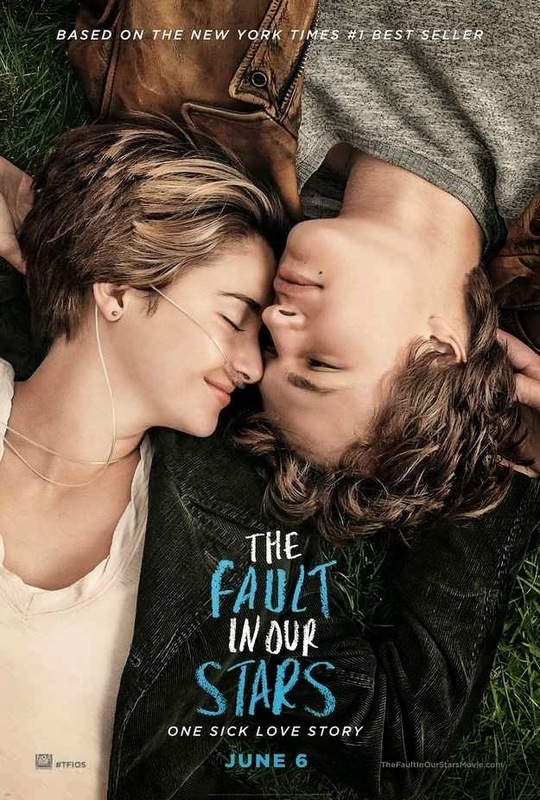 One of the most emotional, heart-breaking and talked-about books, TFiOS is something we will need our issues for on 6th June - which is a lot sooner than everyone thought it would be! We only need to wait six months, which compared to the wait of Catching Fire, is Okay. Okay? I think we can all admit we were quite surprised to see that a TFiOS movie-poster had been released; and so quickly! It appeared online and for a moment, I thought it was a fan-made poster that was filling up my Twitter-feed. There has been a huge-amount of discussion over the tagline - personally I'm not such a huge fan of it - I absolutely love Shailene Woodley as Hazel, and Ansel Elgort as Gus, and I think they are going to do a brilliant job! I couldn't be more excited for this movie - as John Green's involvement in the whole filming-process and the love of the fans, makes me think it will stick extremely close to the book. I doubt I'm the only one who wants a trailer for Christmas! 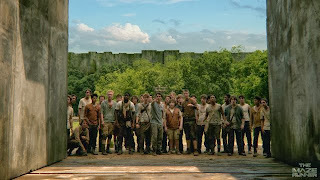 There's yet to be much more than a few stills, but the adaptation of James Dashner's book is bringing something different to the screen, as it has a male protagonist. I haven't read 'The Maze Runner' yet, but I'm excited to see a YA book-to-movie that is being told from a Male's perspective. I think it's important to appeal to boys and girls, and this should do just that. It has been a while since boys lead-the-way, and in the mix of Katniss and Tris, I'm looking forward to seeing this film - and reading the novel! The first part of the conclusion to one of the biggest book-to-move franchises driven by Jennifer Lawrence as heroine Katniss Everdeen - the rebellion will begin on the 21st November! I can't quite believe next year is when we get to see District 13, meet Coin, and Katniss becomes the Mockingjay. Catching Fire was so good, and visually incredible, leaving really high-expectations for Mockingjay, but luckily, it won't be too bad in terms of needing my tissues. That's Mockingjay Part 2's job! Even so, I am obviously hugely anticipating seeing all my favourite fictional characters on screen again! There were some incredible moments in the book! Also in 2014, the first Vampire Academy Movie and the next Hobbit film are released! Which movie adaptation are you most looking forward to? Tell me below! Sophie, Sophie, Sophie... You are trying to give me a heart-attack, yes? I shall list my reactions to each film. The Book Thief: Once I've read the book I'm sure I'll be extremely excited. Divergent: I shall spend the whole film crying and hating Allegiant. The Fault in Our Stars: I'll spend the whole film crying and then have hide my face in a hat because of all the ugly crying. The Maze Runner: I'll spend my time feeling giddy, scared, horrified, and staring at Dylan O'Brien. Actually, I'm surprised I survived writing this post so, I have no idea how you read it all! I love the way you commented! You didn't like Allegiant? I really liked the ending - but I think it will affect my thoughts on the film! Rita, I think you should start storing the tissues! I think they've made the right choice cast for The Book Thief. I love the book so much that the movie had better live up to it. I was hoping Death would narrate it. (S)He's a very important part in it. Divergent and The Fault in Our Stars are what I'm really anticipating. I'm sort of stalking Ansel Elgort and Shailene Woodley. Even just watching the trailers make me go all numb and give me goosebumps and get me all excited and just bleurgh!! Ahh,. I seriously can't wait!!!!! I had The Book Thief on my Christmas wish-list, but all the copies in the shop were damaged and that annoyed me! I loved Death's narration when I read the first one-hundred pages though! I can't stop clicking on their Twitter pages for news either! I really hope to read The Book Thief before the movie comes out - it's on my Christmas wishlist! I also need to read The Maze Runner before it hits cinema also! I've been hearing such good things about both books for years I ought to pick them up! I'm so excited to read both books - the movie edition-cover for The Book Thief is just gorgeous! Mockingjay is being split into two parts! I don't think there's enough in the book to make three exciting movies out of from it! SO excited for Mockingjay part 1. These movie adaptations are definitely some of my favorites. I look forward to the Book thief (and I'm scared), because it's one of my favorite books. I really want to read The Book Thief and The Maze Runner before they come out as movies because I have heard many great things about them. The Book Thief just looks amazing and I'm excited. I'm not too sure what to think of the Divergent movie yet. I hated it when I saw the casting for Tobias but it's looking a little better. I guess we'll find out when it comes out. OMG SO MANY AMAZING BOOKS! I'm so excited but I really hope they do their books justice. CATCHING FIRE WAS BEYOND AMAZING, I really hope they can continue to pull it off in Mockingjay! SO EXCITED FOR TFIOS AHH!